Political parties in Sarawak have also been urged to state their stand on the seizure of bibles from the Sibu prison. KUCHING: The issue of “Allah” and the Malay Bible is far from over. It has cropped up again when prison authorities seized hundreds of Malay and Iban-language Bibles with the word “Allah” from a prison in Sibu over the past few weeks. This has not gone down well with the Christians who make up 44% of the state’s population. And the Sarawak DAP has seized the opportunity to make political mileage by asking the candidates and political parties to make their stand. Julian Tan, DAP candidate for Stampin, said that the Malay Bible has been published for more than 400 years in Sarawak. It is widely used in rural Sarawak especially among the natives. “Why does this word ‘Allah’ suddenly become an issue?” asked Julian. “The seizure by the authorities is an act of aggression infringing on our constitutional rights and freedom of religion as well as violating the rights of the indigenous Sarawakians who form about 44% of the state population,” he said. “We condemn the Barisan Nasional government for this act of aggression and demand it return the copies of the Bible to the prison. “The BN government must respect the rule of law and the Federal Constitution,” he said when commenting on the seizure of the Bibles. The Prison Fellowship Malaysia is afraid that if left unabated, prisoners across Malaysia will be deprived of their religious books at the hands of the authorities. 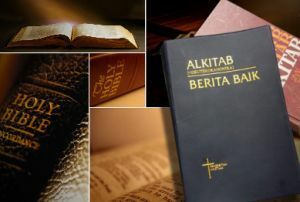 PETALING JAYA: Hundreds of Malay and Iban-language bibles with the word ‘Allah’ have been confiscated from a prison in Sibu, revealed the Prison Fellowship Malaysia (PFM), sparking uproar among the Christian community just days before May 5 general election. This is in spite of the Cabinet’s 2011 10-point resolution, which allows the Bumiputera Christian population in Sabah and Sarawak to bring in and use their bibles in Malay as well as in indigenous languages. “These past two weeks, [prison authorities] kept taking away the Malay and Iban-language bible from the prisoners because they have the word Allah in it,” PFM executive director Prem Kumar told FMT. “So now these prisoners have got nothing to read, and they really need help,” he added. Prem said authorities began seizing the religious books after the Sibu Prison director wrote a letter to the prison headquarters in Kajang, questioning the use of “Allah” bibles by inmates. The Kajang headquarters then replied: “…For your information, the Malaysian Prison Department through memo JP/PML/Kp/2 (58) dated July 25, 2011 titled ‘Use of Illegal Publication As Teaching Tools’ clearly mentions [guidelines on the use of books or articles containing the word Allah in Sarawak prisons]. “As such, you are required to take appropriate action over this,” reads the Feb 22 memo, which is signed by Prisoner Management Director Jamaludin Saad. “So the [Sibu Prison] director took appropriate action and that action was to confiscate the bibles,” said Prem although he added that the English and Chinese language bibles, which do not contain the word ‘Allah’, were not seized. This entry was posted in Uncategorized and tagged ‘Allah’ bibles seized from Sibu prison. Bookmark the permalink. Although I am a non-Christian, I understand that the natives of Sabah and Sarawak have been calling God by the name “Allah” even before they joined up with Peninsular Malaysia to become Malaysia on 16th September,1963.So,it is really cruel and inhuman to deprive the poor prisoners to seek comfort,solace,hope and peace of mind from the Bible. We mustn’t forget that Allah is Merciful; and so is the God that Christians worship. To the extent that we are merciful, especially to those in prison, we reflect that characteristic of the Creator.